For the first time in over 2 months, I was left alone. Sure we'd spent an occasional day or afternoon apart, but this time Jon and Kai were headed a different direction for over a week. Crazy to think this should be our longest time apart over a 6 month span. Probably a good thing to finally have the opportunity to miss one another. As I waved goodbye to Kai, Jon, Emily, and Katie for their bus to Banos, I suddenly realized how quiet it was. Happy to relax and prepare for my upcoming solo ride, I had a moment of brilliance. Utilizing technology to its fullest, I found an online radio stream of the Iowa vs Nebraska game. For the first time all year I got to feel a part of the undefeated season and was glad to learn I wasn't a curse on their winning record. Go hawks! That night I got to hang out one last time with Santi and Carolina, going out to a delicious chicken wrap (I can't remember what they are called for the life of me) restaurant and called it an early night. Hoping to pack up early, I managed to set off the home alarm while getting my bike. So much for letting the hosts sleep in. With a final goodbye, I realized just how different solo riding is. With all my current gear, I also added essential med kit items, the spot beacon, and a tent. Add that with all the food items including a full bag of rice and oats and suddenly my bike was considerably heavier. This might have been alright, but this is Ecuador. And in Ecuador, there are mountains. Almost immediately after navigating Quito traffic, I had a nice little 1400 ft climb out of the city. Never dropping below 9000 ft on the day, I suddenly got very accustomed to altitude. Filled with leftover Thanksgiving turkey sandwiches, I got to experience a cool 50 degrees at the top of a mountain where I could see my breath and a balmy 70 degrees a few minutes later at the bottom. The weather changes are ridiculous and I ended up wearing my underarmour all day to try and even things out. That afternoon, the clouds rolled in and it started to rain. I tucked under a bridge for an hour or so, catching a glimpse of the world's largest active volcano, Cotapoxi, when the rain would let up. Absolutely beautiful with the snow on top. Giving up on the rain ever stopping, I put on my raincoat, tucking the hood into my helmet, and started out. Maybe it's because I was still used to Central American heat, but biking in 50 degree downpours is stinking cold. By the time I pulled into Latacunga, I happily accepted the first hostal I could find and took by far the longest warm shower of the trip. The next morning I left bright and early in case I had to wait out the rain since I learned riding through it is miserable. Although the rain decided to stop, the mountains began to start. Not realizing my next three days would be absolutely insane, I began to climb. With brief bursts of speedy down hill stretches (going over 40 mph at times), I got very familiar at traveling in low gear between 4 and 6 mph. It became a game of steady pedaling and continuous movement rather than speed. After MANY hours on the bike and a lunch at a town called Mocha (yes I did order a coffee), I finally staggered into Riobamba. Stocking up on groceries, I decided to push out of town for a camping opportunity. Glad I moved on, I found a flat area mostly hidden from the road with a small lookout I could cook at for dinner. Feeling smart, I made double portions of rice with onion, green peppers, and broccoli, packing the second part into my Tupperware for a meal the following day. However, let me tell you this was one of the worst decisions I've made on the trip. It's absolutely amazing what a closed, black pannier can do to a bit of food in less than 24 hours, especially with a bit of sun. When I opened it back up the next night, it smelled sour. I also learned my Tupperware doesn't close perfectly because some of my gear had the slime on it as well. The smell of that rice dish was so pungent that I couldn't eat out of my dish for the next couple days until I could wash it out with soap. Vowing to never make a dinner last two days again, I risked sickness over hunger and choked it down with extra water. Besides the dinner and leg exhaustion, that day was entirely pleasant. Accepting my high altitude fate, I was able to fully enjoy the most incredible deep green valley views. Sometimes I even got to see them twice because I would snake down one side just to crawl up the other. Since I was so high up, I had a weird balance of low clouds below me and higher ones above. Stopping to camp at an overlook, I think I saw the most spectacular sunset of my life. The deep valley, sun weaving between double clouds, seclusion, color transition, and placement of the sun on the far end of my view was ideal. When a farmer came up and found me admiring the view, he first told me camping was prohibited but after I pleaded my case and he could tell I was exhausted, he was very friendly and graciously let me stay for the night. The next morning, I woke up in a cloud. Oddly suffocating, the entire valley I was enjoying the day before was filled with thick white fog. Strapping on my bike lights, I continued the climb until the sun finally burned off the haze. Everyday I had encountered immense uphills and tremendous views, which continued, but this particular day decided to add wind. Not a small, steady breeze but strong, swirling gusts. I think uphill it was more annoying when I had to desperately fight for 4 mph but downhill it was more dangerous when you're traveling at over 30 mph and a gust hits you from the side. Panniers act like a sail and you have to drastically lean to keep from blowing into another lane, but when the wind suddenly dies you have to be ready to jump back straight since a 45 degree lean doesn't actually work on a bike. As my third big day of around 70 miles with the most elevation I've ever encountered, I was absolutely toast. Every day I woke up a bit more sore and made up for my slow pace with more time in the saddle. I quit trying to guess the terrain based off the direction of rivers on our map and only assumed up. Debating if I should stop for the day I heard my mother's voice of "don't put off until tomorrow what you can get done today." Dangerous words to live by in the mountains. Pulling into Azoques I found enough energy to buy some amazing strawberries and vegetables for dinner, explored a bit of town, then proceeded to cook on my hostal patio and start reading the Fellowship of the Ring. With a shower and a fresh bed, I was knocked out. Luckily the road to Cuenca from Azoques was almost entirely downhill. Ready for a break, I was super excited to arrive. For one, I had visited the city once before and wanted to see what I remembered. But the larger excitement was knowing that there was a friend waiting for me. 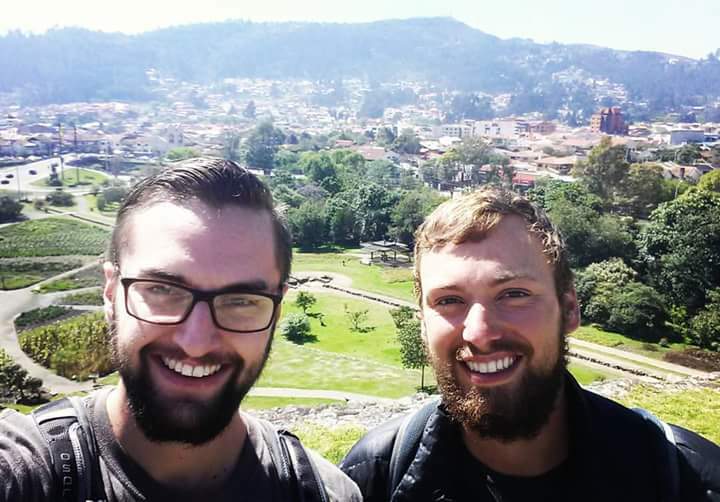 Eli, another Luther student, has been working in Cuenca for the last 6 months as an international programs coordinator for Cedei, and was incredibly kind enough to let me crash at his place. Meeting him at his work, we went out to lunch at a beautiful little restaurant and walked around part of the city. Apparently Cuenca has been deemed worthy of protection, so much of the architecture is still colonial but even more interesting is many of the corner stones are still Incan remnants. As a result, Cuenca is a large city with a small town feel, complete with beautiful parks, small shops on every street, and a gorgeous river walk. It also happens to be the Marry Poppins bag of cities because you can walk into a tiny door and it always seems to open into a giant courtyard full of flowers, tables, and a magic amount of space. Eli is an excellent guide, and he has already dropped more city knowledge on me than I can hope to remember. Our first night was spent with a beer in one of my favorite types of places-on his rooftop. We could see stretches of the entire city and the outline of the surrounding mountains as it got darker and we chatted so long we lost track of time. It's pretty strange in the best of ways to speak with someone who isn't Kai or Jon, and it was great to have some fresh company. Once we looked at the clock and realized it was past dinner time, we scurried down from the roof and Eli brought me to an amazing pizza place. We ordered the largest pizza they made, and I think I may have grossed out Eli a bit when he realized I intended to eat my entire half in one sitting. Spending a bit longer in Cuenca than I had probably intended since something I ate or drank did not sit well with my stomach, Eli continued to show me the city bit by bit, highlighting the best bakeries and cafes as we walked. He knows me too well. We even went to a museum to learn a bit more history and walked through some ancient Incan ruins out back. Wanting to recover, while Eli went to work I cozied up in my sleeping bag and took a nap. Eventually inspired to get some food, I tried to go back to a panaderia in the main square for fresh bread, only to learn the police had blocked everything off to prevent protests. When I say blocked off, it was the full treatment complete with temporary fences, riot shields, combat uniforms, and even a few riot horses. They weren't messing around. Needless to say, I found a different panaderia. That night, Eli was kind enough to embrace my laziness and lack of energy, so we had a movie, popcorn, and ice cream night. With a great stay and even better company under my belt, it is about time to get rolling again. Headed towards Loja to meet Jon and Kai to continue the trip, I can only hope the next mountains are a bit smaller and while they are on the bus they can fully appreciate the pain I experienced to get here. It will be fun to compare stories and experiences for a change, but even better to finally all be back on the bikes together. Thanks again for following along and before long we should be on the next chapter of our adventure in Peru! Ben, I love following you and continue to pray for your safety. We hoped that being from Minnesota helped to withstand the cold rain. Glad you enjoyed the amazing views along our beloved Ecuadorean Andes. Fresh fruit and those views were what we missed most during our years in the US. Enjoy Peru!